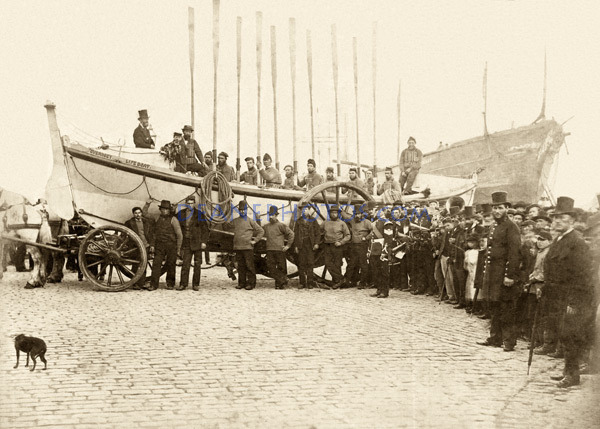 This 32 foot lifeboat the 'The John Lockett' is shown here at the naming ceremony at the junction of the Quay and Crown Pier on the 21st October 1875 before going to its new station at La Lande by land. The careening hard behind shows the ship 'Skandinav' which was rammed by a barque on the 11th August 1875. the captain, son, daughter and two men were lost. She was towed into No 1 berth bottom up and then went to the careening hard. Information from Eric Sharp's and JM David's shipwrecks (La Societe Guernesiaise), also Mayday, history of Guernsey Lifeboats by Guy Blampied. The information above kindly researched by Ian Brouard. This was initially stationed at La Lande. It then went to Northside St Sampson's before going to St Peter Port in 1881.